Steelhead were the fish that got Jim into fly fishing, and he dreams of casting for wild steel in British Columbia. A couple years ago, we ran a series called “Trout Bum of the Week,” in which we highlighted some of the guys living the good life. . .of a sort. (See the bottom of this post for a link to the previous installments.) This is our second round of profiles. Most of the subjects are guides who have turned their passion into a vocation, spending their time in an outdoor “office” that may include a drift boat, gorgeous mountain scenery, and crystal clear water. Others do have day jobs but manage to spend every other available minute on the water with a fly rod in hand. Whether you aspire to one lifestyle or the other, it’s illuminating to explore the different paths these men and women have taken on their way to achieving “trout bum” status. Jim Lampros is the Fishing Manager at Orvis Cleveland and part-time fishing-catalog model. I started fly fishing on Ohio’s Chagrin River when I was in middle school. A couple years prior, I’d discovered fishing for Great Lakes steelhead with conventional gear. Almost immediately, I became obsessed with those fish, and when I saw somebody fighting one on a fly rod for the first time it was like destiny. Sporting camo hippers and my eighth grade backpack, I took my first fly rod fish after school on Halloween, 2002 using a twnty-dollar Shakespeare 4/5 weight outfit that I’d purchased at my local K-Mart earlier that year. The reel had no drag, and the fish went quite a ways into my backing before a fellow angler helped me land it. 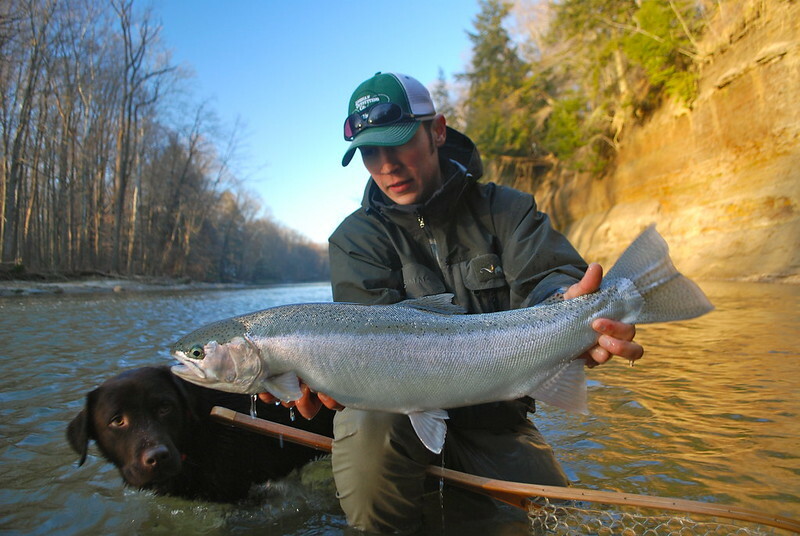 It’s really tough to choose a favorite waterway, but because our steelhead are so close to my heart, I’d have to say the Chagrin River, or Cattaraugus Creek in Western New York. I’ve had some sublime moments on both rivers. This amazing cutthroat left Jim with one of his favorite fishing memories. 3. What’s your favorite fish to chase with a fly rod and why? Though I’ve not spent as much time pursuing them as some other species (and have had very little success), muskies are quickly becoming my favorite fish to chase with a fly rod. There are so many nuances and so much unpredictability, it’s like trying to crack the Da Vinci code. Muskie are one of the few fish I know of—maybe the only fish in fresh water, I should say—that make you feel like you’re at their mercy. Quite literally, they scare me… and I like that. 4. What’s your most memorable fly-fishing moment? My most memorable fly fishing moments usually involve the ones that got away; those moments stay with you. They haunt and humble you. But, there was a cutthroat that I did catch a few years back that I often find myself reminiscing about. I wrote about that fish here. 5. What’s your most forgettable fly-fishing moment? This is the definition of that cast you’d like to do over. 6. What do you love most about fly-fishing? The things about fly fishing that keep me going are the people and the places. The people who dedicate their lives to this sport are often some of the most fascinating you will ever meet. And the places—the rivers, lakes, flats and streams—speak for themselves. 7. What’s your favorite piece of gear and why? Because fly fishing wasn’t necessarily handed down to me, as it was for some people, I don’t have a big sentimental selection of gear. I’ve made a lot of memories with a lot of different rods and reels, and I’d go fishing with a cane pole tomorrow if that’s all I had. But, I do have a Beulah switch rod that my parents got me as a birthday gift a while back. At the time it was one of the only switch rods on the market, and it was the rod I learned to Spey cast with. It’s a beautiful rod, and I can remember many of the fish I’ve caught with it. I don’t believe there’s a fish on the planet that won’t eat a Woolly Bugger under the right circumstances. Stranded anywhere in the world with one pattern to fish, I’d take a Bugger Barn o’ Buggers without thinking twice. But, that’s a pretty boring answer, isn’t it? My confidence fly for trout fishing is a Chubby Chernobyl. I love that fly! It’s visible to both you and the fish, it has lifelike movement, it lands right 99 percent of the time, and I can put it anywhere I need to with a 9-foot 5-weight in my hand. As a Midwesterner, Jim partakes of all the great fishing opportunities his home state offers. 9. What was your favorite fly-fishing trip? I live for fishing on the road. There are so many enjoyable elements: the journey, the company, solving (or trying to solve) an unfamiliar water or technique or species, meeting new people, the food, the drink. A few buddies and I have made it a tradition of sorts over the last couple years to head up to northern Michigan in late January, when our local streams are usually locked up with ice. The fishing’s never been great, but it’s all those other elements that make it a memorable trip at a time when we’d otherwise be at home tying flies for warmer weather. 10. What’s your next dream destination? Like you, the list of places I long to visit has no end in sight. But, if you gave me my choice tomorrow, I’m going steelhead fishing in British Columbia. I want to be in that emerald green water, pumping casts, mending, and waiting and hoping. And if a wild steelhead happens to find my fly… I just don’t even know what I’ll do. 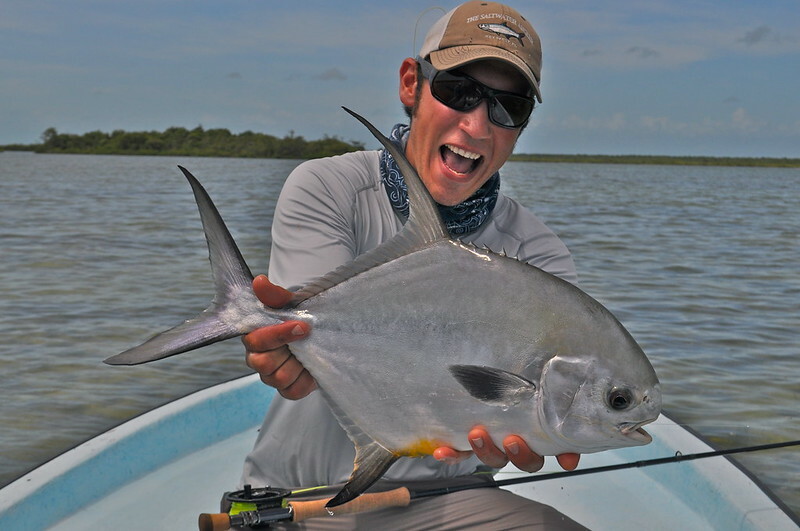 This fish, part of a Belize grand slam, was also Jim’s first permit.